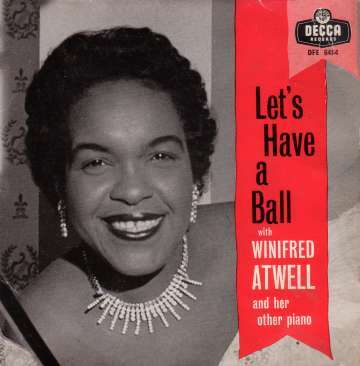 Winifred Atwell was an accomplished and versatile pianist who was idolised by the British public throughout the 1950s. She had studied the piano since she had been a small child although she later became trained as a dispenser in the expectation that she would be employed in her father's pharmacist shop. By the age of 30 she became aware that other local musicians had gained further musical training abroad and, encouraged by this, in 1945 she left for the USA. By the late 1940s she had gained a place at London's Royal Academy of Music with ambitions of becoming a concert pianist. However, in order to finance this initiative she worked during the evenings at London's clubs playing piano rags. By 1950 her popularity had spread nationally and she began recording with Decca during 1951- before the advent of any record sales 'chart'. Her music also worked well on TV where she made regular appearances. She would normally start her act by playing a classical piece on a grand before transferring herself to what she called 'my other piano' which was an old 'honky tonk' upright. It was on this that she recorded many of her most successful numbers including her two #1's and the now legendary 'Black And White Rag' which has been used as the signature tune of BBC's 'Pot Black' snooker programme for several decades. The 1958 EP shown here (DFE6464) was one of Winifred's most popular and finds her playing some chart favourites of the time on her honky tonk upright piano. This is just one of the myriad of EPs that were issued. They were a good choice for those of us that wanted a little more than you got with a single, but didn't want to pay the price of a long player. Despite her continued popularity, her record sales slumped at the end of the 1950s. She made several attempts, probably mistakenly, to revitalise her sales by pandering to popular trends like the 'Twist'. Her 'Tops In Pops' medley of 1960 included 'Seven Little Girls Sitting In the Back Seat', 'Oh! Carol' and even 'Way Down Yonder In New Orleans'. Winifred married a former comedian, Lew Levisohn, and as her recording career faded in the UK she and her husband emigrated to Australia. She began concentrating more heavily on Classical music than she had done in London and frequently toured with symphony orchestras. She continued to give well attended concerts up until the time of her retirement in 1978. Sadly, Winifred Atwell died during 1983.